Northern lights and fjords — that’s what Norway does. And experiencing both just got a little easier in Norway’s northernmost city, Hammerfell (which sounds like the setting of an Avengers–Game of Thrones crossover epic). Why? 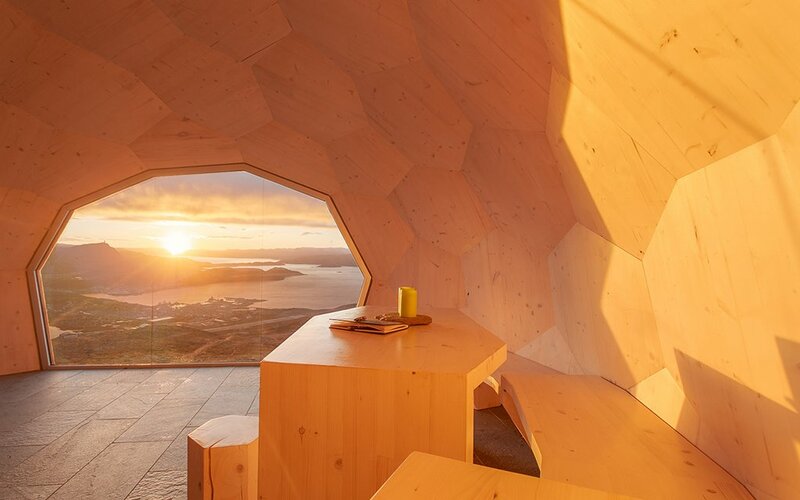 Because design firm Spinn Arkitekter just built a pair of fascinating mountainside cabins for weary travelers. 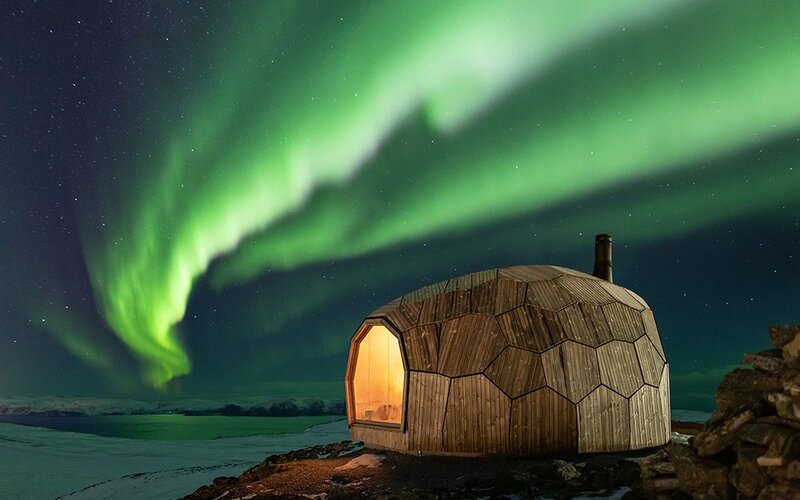 Each cabin is bedecked with an inspired turtle-shell exterior featuring wood from local producer Kebony, giving it the appearance of a cabin/igloo hybrid. Hammerfell is in the subarctic and receives a yearly onslaught of snowfall and even avalanches, but the rounded shape here keeps snow from collecting or causing structural damage, and also protects against nagging winter winds. The wood was finished with flames (leveraging the Japanese method of sho-shugi), which waterproofs each board and ensures durability for generations. But Spinn’s details-heavy process goes further back than that. Before the huts were even built, they took a 3D-laser scanning of the area and made decisions on where to position the window and door based on their findings. You’ll also appreciate the craftsmanship in the airy interior, which looks like the perfect spot to curl up with a book and bemoan that the cabins aren’t listed on Airbnb. Hammerfell could have the most banal hiking trail in the world (it doesn’t) and it would be worth a visit just to take a load off in these things. If you’re planning a trip, a heads up: come sometime between January and May. Polar night occurs from November 23rd to January 19th (the sun literally doesn’t rise) and midnight sun lasts from May 14th to July 31st (the sun literally doesn’t set). Early spring will give you a nice compromise of the two, and still a fighting shot at the Northern Lights, but we won’t tell you how to live your life. For more information on the cabins, head here. The site’s in Norwegian, so have Google Translate at the ready.